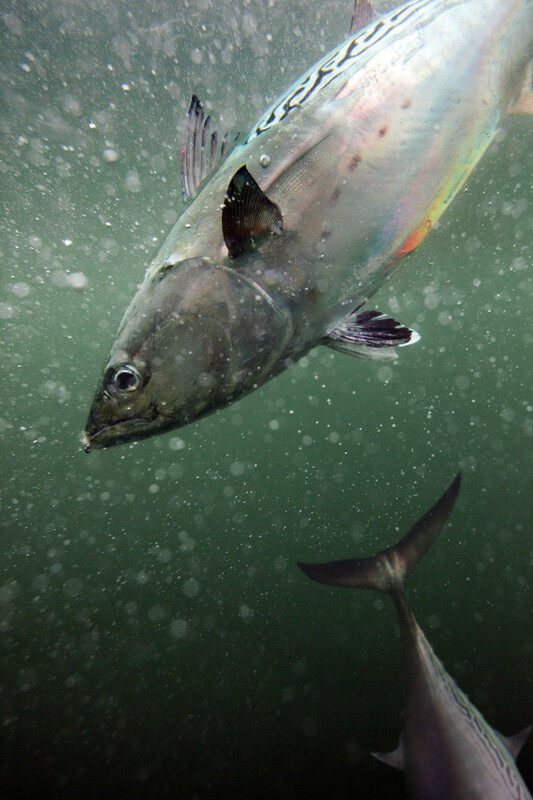 A false albacore sends silversides skyward during a blitz off North Carolina. It’s a raw, cold October morning off North Carolina’s Barden Inlet. A shrimp trawler steams south with about 10,000 seabirds in tow. A layer of thick, gray clouds hangs low in the sky. A bone-chilling westerly stirs up steep, foam-capped waves. Anyone with even a smidgen of common sense is still in bed. An exhausted albie comes alongside after fighting the good fight. High on the afterglow of the previous day’s false albacore fishing, my friends Hugh, Kendall and I want to get in a few hours of fishing before the real blow fills in. Hugh weaves us through the confused inlet chop while Kendall and I hold shut the hoods on our foulies. We’re making about 20 knots through the slop when we discover other crazies. At least 15 other boats line up behind the trawler like it’s a Chick-fil-A drive-through. Mates pitch bycatch overboard. Dozens of sharks and false albacore slice through the trawler’s prop wash.
“Pitch it!” Hugh yells as I back-cast a crease fly across the melee. 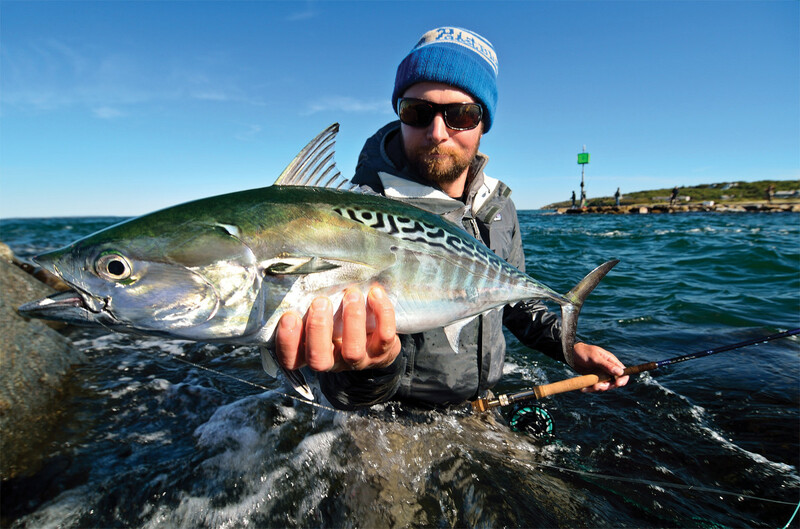 I make three quick strips before a wide-shouldered false albacore T-bones the fly at 30 mph. Moments later, the fish lights the solid rockets. Backing screams off my reel as if I’ve hooked the bumper of a pickup truck. My 9-weight almost doubles over from the pull. The fish is three-quarters of the way through 300 yards of backing before it appears to tire. It’s the first of several runs. We play this game for 10 minutes before it comes alongside. I tail the fish and hook it up to the BogaGrip. “Fifteen pounds, not bad,” Hugh says before I toss the fish back and massage my sore arms. 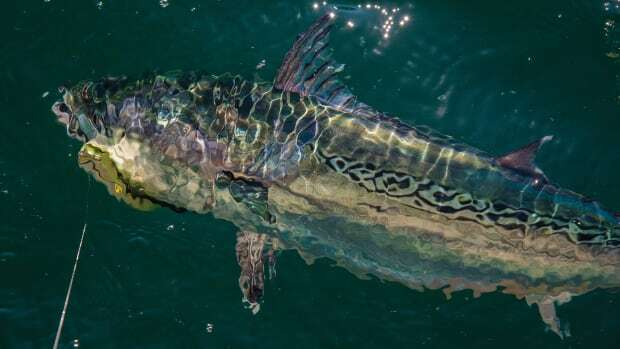 The hard-pulling false albacore (also known as little tunny, albie, fat Albert, ’core, atomic football and falsie) has all the credentials you want in a pedigreed gamefish. Its muscular, colorful, streamlined body has fins that fold flat for speed and articulate like mini-rudders for maneuverability. Fueled by a metabolism that warms it above sea temperatures, an albie will crash a school of bait with its back flickering neon green. Hook one on fly or light tackle, and you’re doomed — forever addicted. False albacore spend much of their lives offshore but are drawn to coastal locales when baitfish flush from sounds and rivers each fall. The false albacore is a member of the wide-ranging tuna family and can be found in subtropical waters around the world. 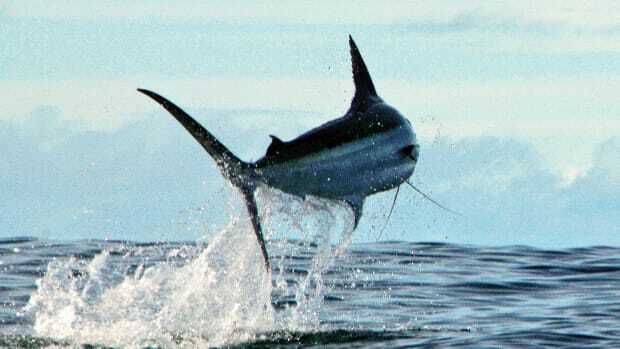 They are an important food source in South American, African and Mediterranean countries, but most East Coast anglers consider them inedible, making for a sustainable catch-and-release fishery. “We don’t have any scientific assessments of the small Northeast gill net fishery involved with catching them, but Atlanticwide catch reports have fluctuated between 13,000 and 24,000 metric tons for the past 20 years,” says John Graves, a chancellor professor of marine science at the Virginia Institute of Marine Science in Gloucester Point, Virginia. 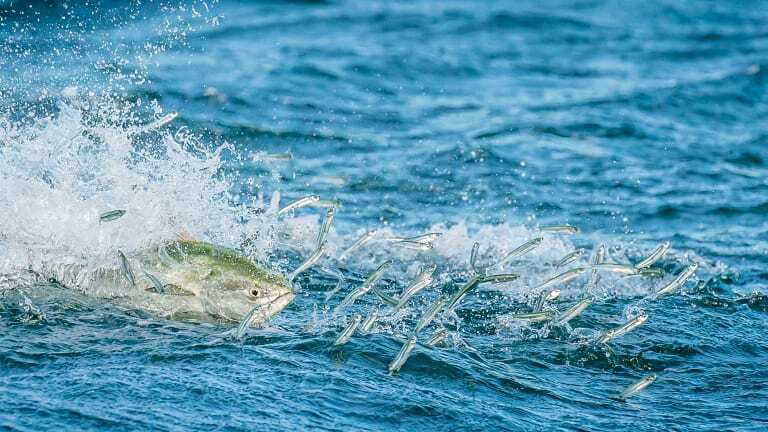 Those movements often are timed with the flush of baitfish from tidal estuaries and rivers out into the Atlantic, where packs of albies lie waiting. They round up everything from bay anchovies to peanut bunker to silversides, driving bait balls to the surface and crashing through them at high speed. 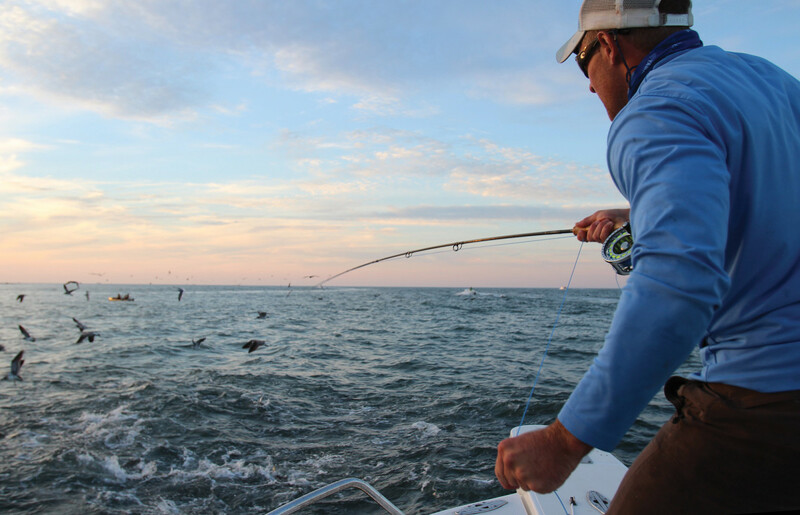 It’s a spectacle anglers never tire of, an oceanic version of the Serengeti. Dropping a well-placed fly into a maelstrom of feeding albies almost always results in a spectacular hookup and sore arms. 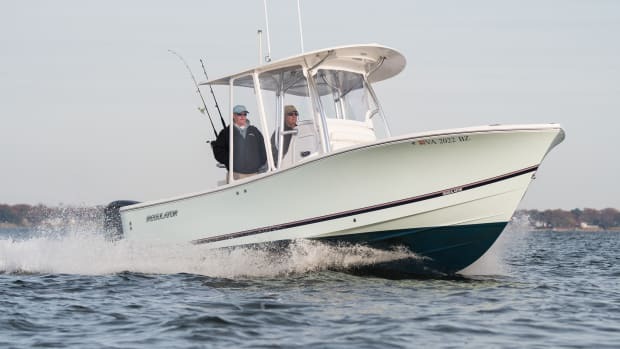 As the season progresses, the Martins head south to Cape Lookout, North Carolina, which is close to the epicenter of fall false albacore fishing. It’s a fishery that has had a fanatical following for almost 30 years. Gardner’s husband, Capt. Brian Horsley, also guides the false albacore season off Cape Lookout. The couple are widely regarded as Jedi masters of the fall albie season here. I grab my 9-weight and wait for the albies to surface again. A half-dozen 15- to 20-pounders leap gracefully out of the water as I put a fly in their path. 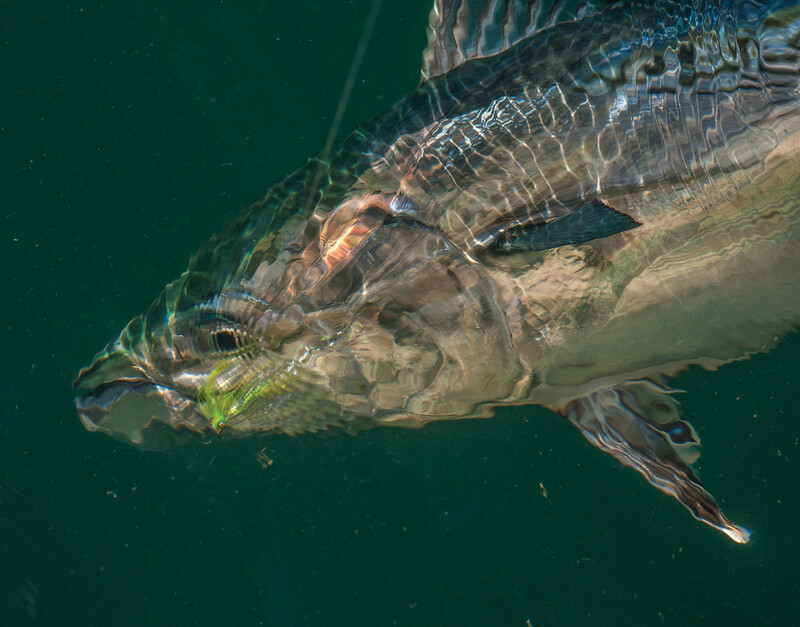 Wavy lines, splashes of green and iridescent mother of pearl make the false albacore a handsome fly- and light-tackle adversary. Selective fish such as these can drive anglers mad. So can sippers — picky albies feeding on snot bait. They can be as fussy about flies as any limestone creek brown trout. I ready myself for the next salvo. A 15- pounder surfaces like a submarine performing a tactical maneuver. My small fly lands right in front of the stocky fish and is immediately inhaled. Seconds later, the afterburners light, and the fish streaks for the inlet. After several strong runs, the albie comes alongside, and Gardner plucks it out of the water and hands it over for a photo. It’s gorgeous. 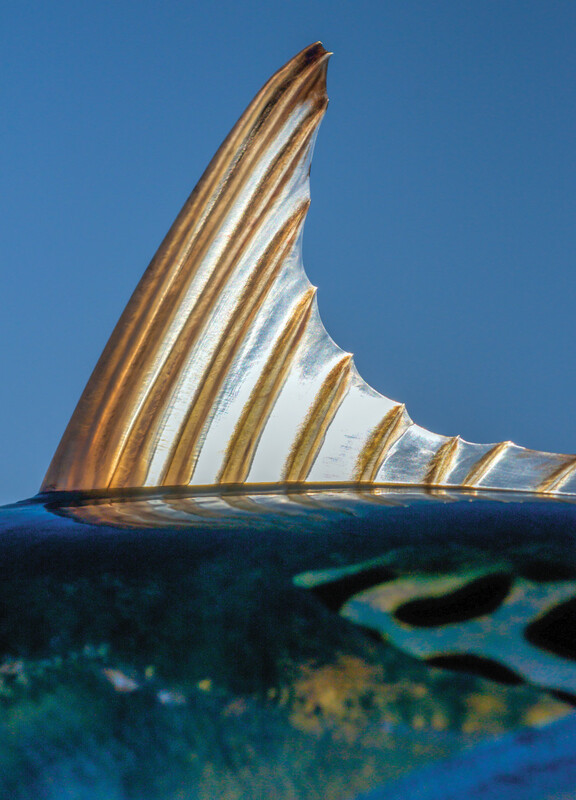 I follow the lateral line of my catch to its tail while tracing the wavy turquoise and black lines along its back. Its belly shines in iridescent silver, and its head gives off a green glow as a row of translucent mini-fins along its tail quiver and shimmer in the morning light. I look around at the scenery and the fish and think, This is hard to beat. 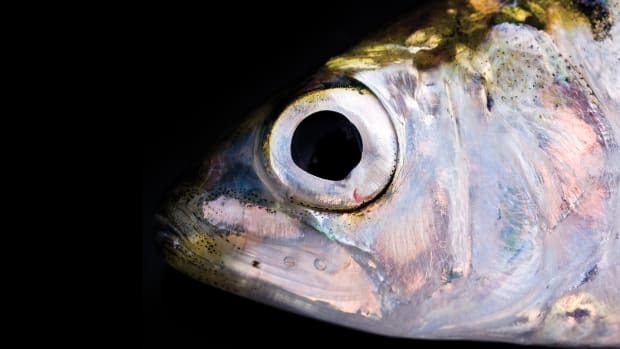 In Florida, false albacore have a reputation that is far less glamorous than in New England and the Mid-Atlantic. 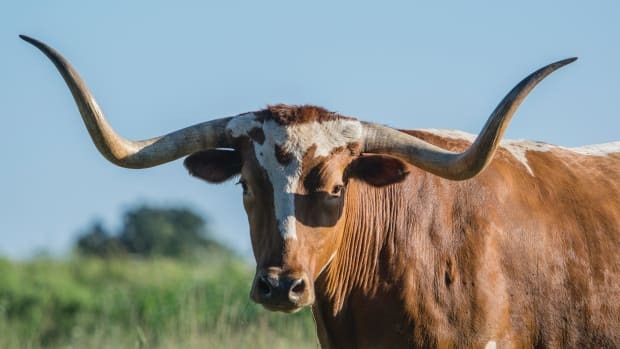 In fact, locals don’t even call them by their given name. “Don’t strip that line or you’ll catch a bonita,” my guide says as we drift flies for snook over a wreck off St. Lucie Inlet. The guide turns his back, and I make three swift but stealthy strips. The line pulls tight and starts peeling off the reel. After a short fight, a 5-pound albie ends up in the fishbox for shark bait. This article originally appeared in the Fall 2018 issue of Anglers Journal magazine. 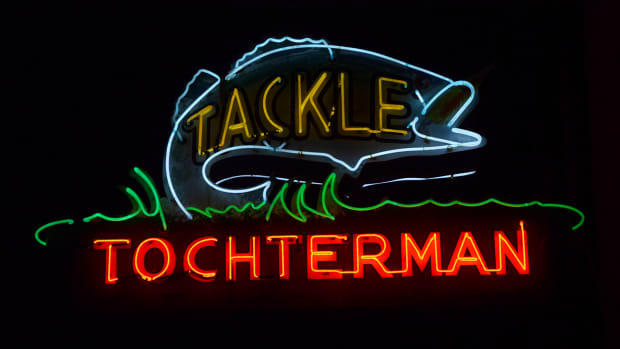 Venerable Tochterman’s tackle shop in Baltimore has been satisfying the wants and needs of generations of fisher folk for 102 years. 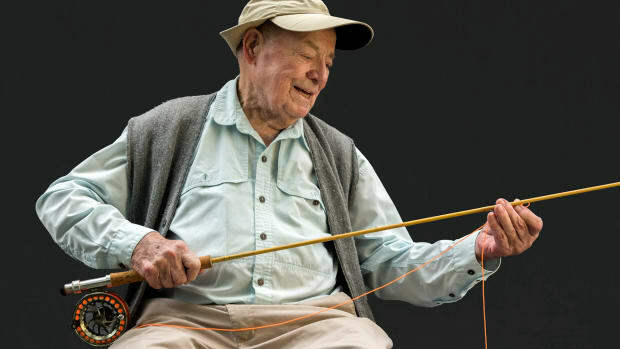 Lefty Kreh will be remembered as one of the most influential and beloved figures in fly-fishing. Jake Jordan made possible what was once believed to be nearly impossible: catching blue marlin on a fly rod. 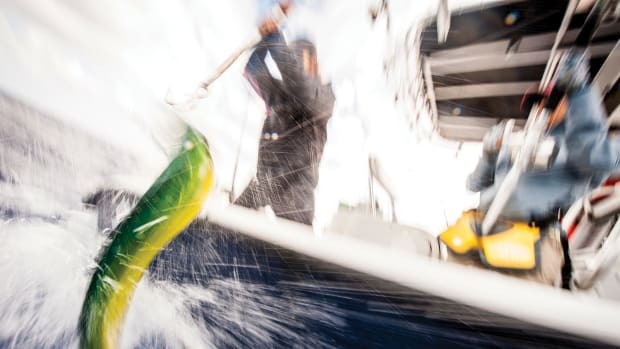 Whether trolling or “running and gunning,” mahi are great on the rod and on the table. And pound for pound, a big one is a handful on a fly rod. 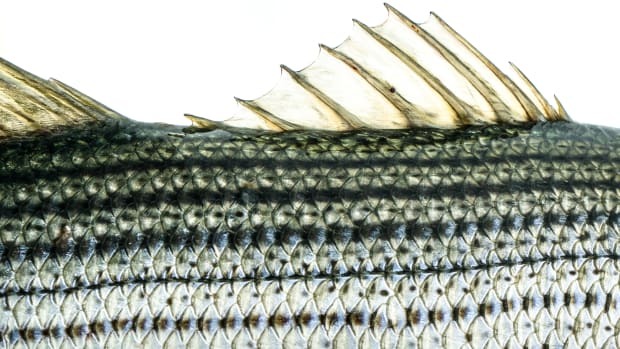 Spring calls winter-weary anglers out of hibernation in search of the patterns and clues that point to the early runs of striped bass.